When I found out my husband and I would be going to Seattle for the first time for his business trip, I immediately knew a visit (or two or ten) to the very first Starbucks was in order. 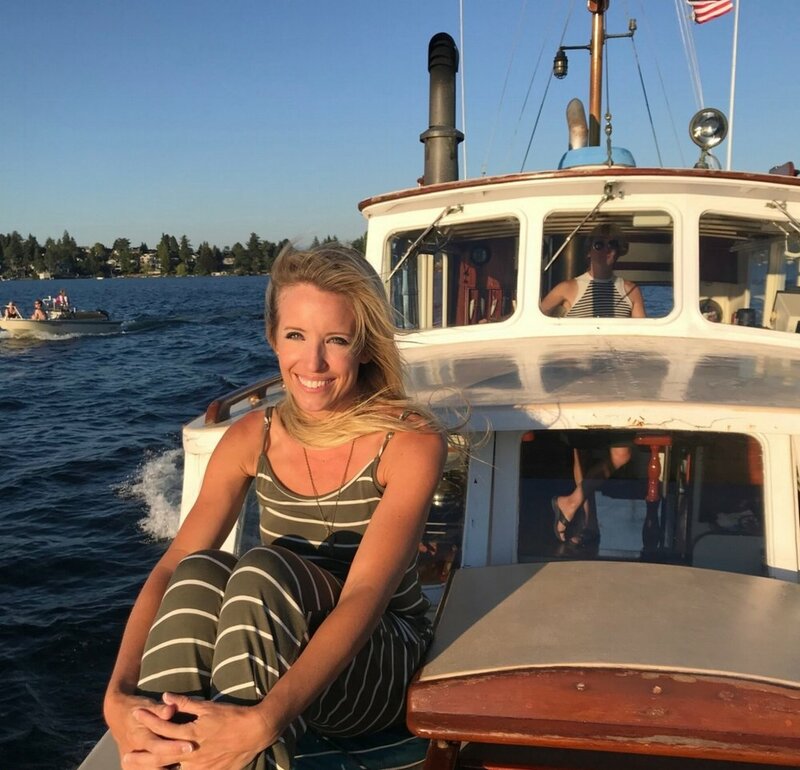 After frantically searching the interwebs about additional ways to spend our long weekend in the Emerald City, I stumbled upon a “private luxury romantic yacht excursion” on South Lake Union – yes, please! Take my money! I couldn’t click fast enough and before you could say “yolo”, we were signed up for a trip for two on board The Corsair with Captain Dave Petrich. Captain Dave picked us up in this beauty, a 1939 classically restored wooden yacht. Stepping on board was like stepping back in time. Nostalgic, romantic and so much character! Captain Dave gave us a thorough tour before we settled in comfortably on the front of the yacht to take in all the sights, sounds and feels. The Corsair was built in 1939 as sports fishing utility boat. After sailing under the name “Ocean Pirate” in the 50’s and “Salt Shaker” in the 60’s, she was renamed “Corsair” after the legendary pirates of the West African Coast. Captain Dave told us the boat had been in his family for quite some time and he restored the boat to all of it’s current glory! Incredible! And off we went! 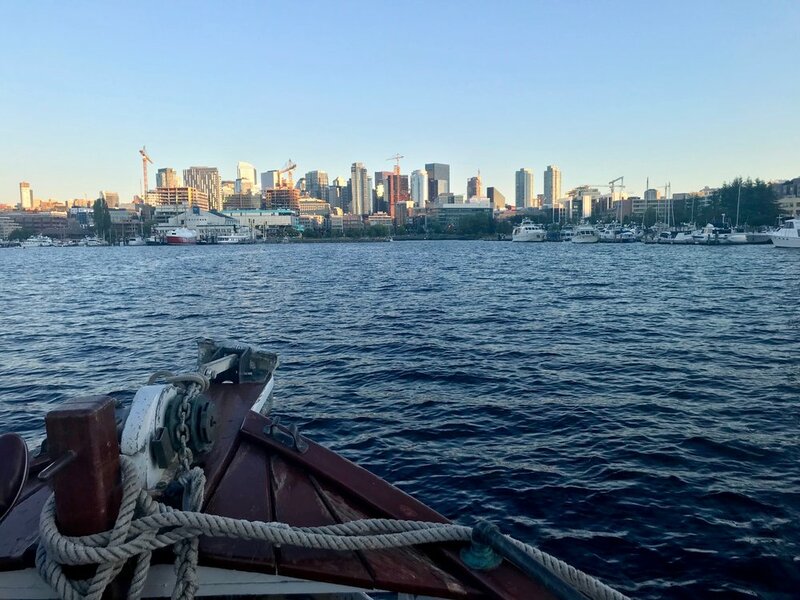 As we sailed around South Lake Union, Captain Dave pointed out some interesting sights and shared lots of fun facts about the area. His roots and knowledge of Seattle and the South Lake Union area definitely run deep! I would say the information he shared took this tour to a new level. Very entertaining! One of the first sights on our tour.. floating houses! Everywhere! Really NICE houses too! And if you have millions of dollars laying around, one of them could be yours. Captain Dave took us down the Eastlake side of Lake Union and under the bridge to Portage Bay then into Union Bay. The photo to the right is in Union Bay where Bill Gate's home is somewhere behind me. As we headed back towards South Lake Union, Captain Dave pointed out something particularly interesting, not far from Husky Stadium, and told me to snap a photo (below). 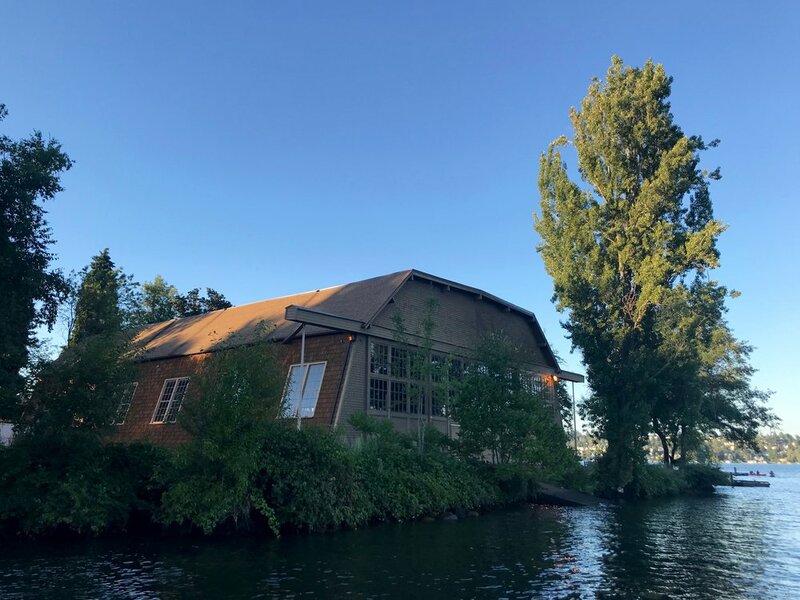 After we got through the Montlake Cut into Portage Bay, Captain Dave shared the story behind the storage shed, which is where the University of Washington’s 1936 Olympic team stored their boats and equipment. A book called “The Boys in the Boat: Nine Americans and Their Epic Quest for Gold at the 1936 Berlin Olympics” details their incredible story of American Olympic triumph in Nazi Germany. It’s a New York Times bestseller and is now at the top of my “must read” list. We also learned there are boathouse tours available if you want to get a closer look into legacy of “the boys”. A few other highlights on our way back to the north and west sides of South Lake Union: Dale Chihuly’s house, Gas Works Park, and the houseboat from the movie, Sleepless in Seattle. See photos below. You can’t head back to land without snapping a photo of the Seattle skyline. I highly suggest the evening cruises as there’s truly no better time than the golden hour on the water.. such a soft, warm, special night with my husband! Not only did this cruise with Captain Dave not disappoint, it was the crowned jewel of our long weekend in Seattle! Thanks, Captain Dave, for the memories! 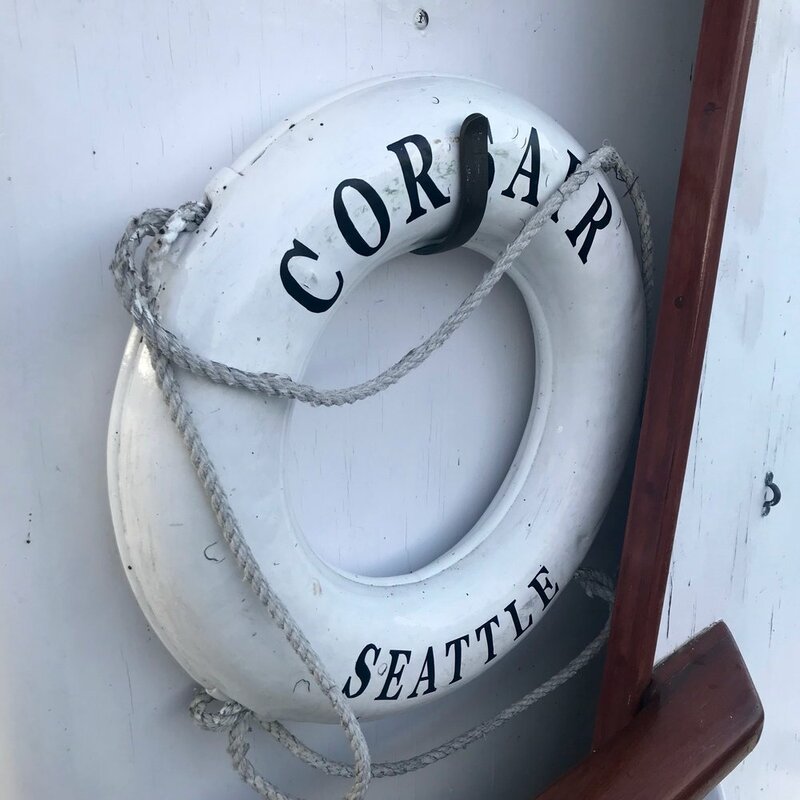 Next time you’re in Seattle, I hope you get a chance to take a cruise on board The Corsair with Captain Dave! For more information, click here for a link to their website. Cheers!